Heavy Planet presents today's "New Band To Burn One To"...MOJO WAVES! Mojo Waves is a power-trio rock group based in Vantaa, Finland. The band was formed in late 2011 but the musicians have been playing together for some years. 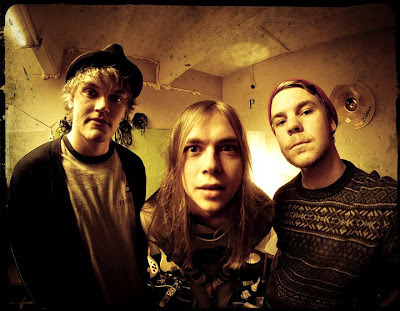 Mojo Waves' sound is something that you wouldn't expect to come from Finland. These days most of the Finnish rock bands play over-produced, safe and highly predictable music that lacks the attitude and the spirit of what rock music used to be in the past. Mojo Waves is the opposite of the common rock band. It's unpredictable, personal and energetic. Although influenced by vast amount of bands, its sound is unique, and its music doesn't fit in any one category. Although the band feels some sort of spiritual connection with the rock music of the past, it doesn't try to copy its influences. The main goal of the band is to make their own personal songs that they can be proud of and play as many gigs as possible. Live music is what music has always been about, and that's what the band loves most, too. "Heavily stripped down and infectiously groovy, these guys definitely have their "mojo" on at full-force. The first think I thought when I heard this band was, "how old are these dudes?". The band looks to be in their teens but play much more mature. Combining heavy psych, garage-rock power and an extremely high-octave shrill, these boys (eh eh) men know how to rock your face off. This is rock and roll to the umpteenth level: raw, fun and wildly unpredictable. Check out some of their tunes available on SoundCloud and be prepared to be thrown back in your seat."